Iranian blogger Arash Zad arrested even though he stayed away from politics. 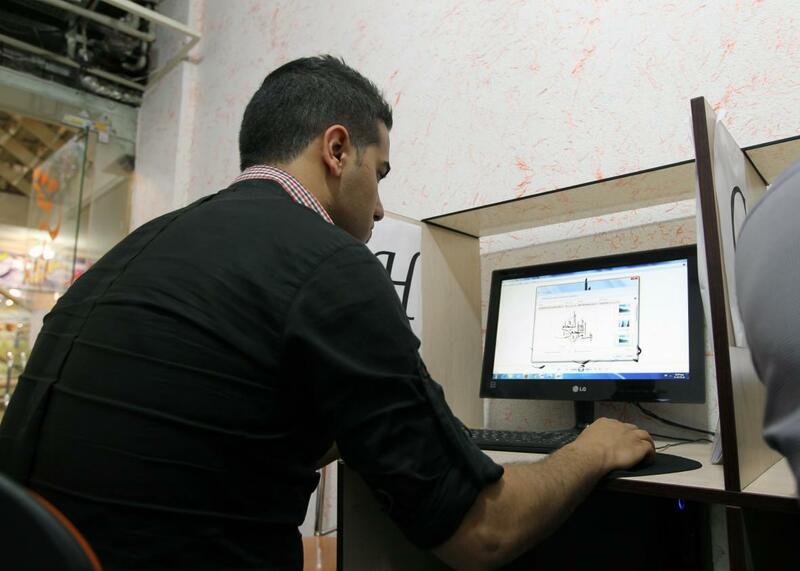 An Iranian uses a computer at a cybercafe in Tehran on May 14, 2013. In early September 2015, members of the Iranian technology community noticed that prominent Iranian tech blogger Arash Zad seemed to be missing from cyberspace. They soon learned from his family and friends that Zad had been under arrest since the end of July, when he was detained by the Revolutionary Guard’s intelligence units. Zad is an Iranian who lives in Turkey but had been visiting his home country for a holiday. His arrest has shaken the Iranian technology community because Zad, while an advocate for women and digital security, has always steered clear of politics—and if he can be detained in Iran, there’s little hope for others who are fighting for digital freedom. Zad’s arrest comes at a time of great tension around Internet policy and regulation in Iran. President Hassan Rouhani’s administration has advocated for more Internet freedom and development in the field of IT—but there seems to be a counterbalancing effect by the Supreme Leader Ayatollah Khamenei as well hardline factions such as the judiciary and the Revolutionary Guards. According to recent reports, the Supreme Council of Cyberspace’s authority is increasing, alongside the launch of the guard’s new surveillance program known as Spider. Amin Sabeti, an Iranian Internet researcher who follows cases of arrests of netizens inside Iran closely, told me that he saw Zad’s arrest “as a strong signal from the Revolutionary Guards.” In the new climate of open foreign investment following the nuclear agreement, the guards are issuing a warning, he says, to entrepreneurs, technologists, and bloggers. The news of Zad’s incarceration explained phishing emails that had been sent from his email account to many of his contacts at the beginning of August. For instance, Internet researcher Nariman Gharib received one such email on Aug. 2. Although not certain, it’s possible these attacks originated from the Revolutionary Guards intelligence units. Zad, who was visiting Tehran on a trip from Turkey, is widely considered a tech pioneer tech in Iran. He first rose to prominence between 2008 and 2012 within the Iranian blogosphere with Weblogina, where he wrote about technology, Iran’s IT culture, and startups. His work is largely focused on improving people’s digital lives. He founded Zig Zag Labs, a tech start-up that developed Ladybug, a project intended to encourage and empower Iranian women in the field of technology and entrepreneurship. Zig Zag Labs won the United Nations Youth Award for advancing the Millennium Development Goal of “Power to Women.” Zad is also one of the core members of the volunteer moderator team for Farsi translations on Twitter. In September 2012, the state-run IRIB Education channel Shabakaye Amoozesh Sima even featured Zad in an interview on its technology show Barkhat (“Online”). Prior to his arrest, he was slated to launch a new project aimed to educate elderly Iranians on new and secure communications tools. The details of Zad’s arrest remain unclear, though human rights organizations like Reporters Without Borders and Article 19 have called it out as arbitrary. Those close to Zad and his family have been reluctant to speak or publicize the case for fear of compromising his release. Zad was a prolific presence on Twitter, and tweeted about his trouble-free trip to Iran up until a few hours before his arrest on July 31. His tweets give no indication that Zad considered his work in opposition to the Iranian authorities—indeed, he had seemed welcome by the government. This arrest highlights the often unexpected turn of events for those with a public online presence within Iran can face. This is not the first time a technologist and blogger, with no particular political agenda, has been persecuted in Iran. In 2013, the eight technology bloggers known as Narenji were similarly arrested for arbitrary reasons that many associated with their connections to Western organizations. It is clear, however, that Iranian authorities such as the Revolutionary Guards perceive threats to the state based on red lines that are often invisible to the “offenders” and tied to the current political climate. It seems as if Iran’s hardliners are increasingly concerned about the country’s startup community. In an article of caution against startup projects, the newspaper Kayhan, which is affiliated with the office of the Supreme Leader, warned that Western-funded startup projects could steal the ideas and labor of Iran’s educated and entrepreneurial youth. Given the importance of this publication, this is a clear sign that greater controls in this sphere are coming. The nuclear agreement raised hopes among Iranians that improvement in economic development and online freedoms could be on the horizon. Cases like Zad’s give pause to that optimism. Like many other policies in Iran, the arrest of a figure like Zad further reinforces fear and self-censorship online.